Celebrity Cruises offer modern luxury on board their ships, with award wining cuisine and top quality service. Celebrity ships have a wealth of facilities on board to ensure you are fully pampered whilst on board and your expectations are exceeded at every turn. Celebrity has great all inclusive options with meals at most restaurants, room service, soft drinks, accommodation, activities, theatre shows and workshops all fully included. 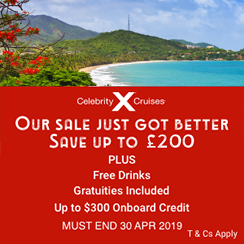 Celebrity Cruises can take you to all around the world to as far afield as Asia, USA, South America, Canary Islands, the Caribbean, Australasia and many other spectacular destinations in the lap of luxury. Celebrity Cruises are also one of the few Cruise Lines to sail to Antarctica. Sail away on Celebrity Infinity and explore this spectacular continent. Every stateroom on board a Celebrity Cruises ship has a dedicated steward available 24 hours a day. Celebrity are particular proud that they are able to offer 85% of their staterooms with private balconies. All staterooms come with a sofa and seating area, plush Egyptian cotton bed linen, mini bar and flat screen TV as standard. Passengers travelling in suites can also enjoy butler service, separate sleeping areas, complimentary sparkling wine, fresh flowers, fresh fruit, in-suite coffee machine, afternoon canapés and preferential service at embarkation, debarkation, restaurants and theatre performances. 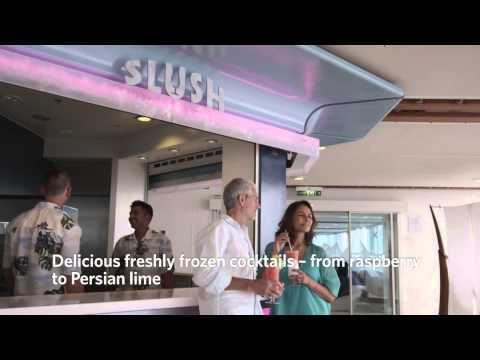 There are a wealth of dining options available on board a Celebrity ship. The main dining room is the centre piece of every ship where you will experience exquisite cuisine and top class service from your waiting staff. Attention to detail is key to Celebrity and dining is central to this. With a range of dining options available to suit every preference and dietary requirement. Speciality restaurants each have their own theme and charm. There are restaurants delivering Asian fare, grills, and French and Italian cuisine. With this many options you are always going to find something new to surprise and amaze you. There are also more casual options available in the form of buffet style service, pool grills and café’s. Room service is available 24 hours a day if you wish to enjoy something in your room. There is always plenty to do on board a Celebrity Cruise ship. You can learn new skills in workshops from dancing to languages, you can experience new flavours in a cooking lesson, get physical in a fitness class or join in some games of pool volleyball, basketball, table tennis, lawn games and interactive video games. There are also a wide variety of competitions available from cooking, to quizzes, to dancing. If you are not worn out after all that you can take in a theatre productions, enjoy a game at the casino, dance the night away in the nightclub or casually sip on a drink in one of the many bars and lounges open to you. Celebrity ships all feature swimming pools so you can just relax by the pool and soak up the rays if you wish. Celebrity provides a full range of youth programmes and family friendly activities for your family to enjoy. Fully trained staff will be on hand to ensure your children get the most out of their holiday and make plenty of friends. The Fun factory provides activities for 3 – 11 year olds between 9am and 10pm daily. A fun mix of sports, arts and crafts, games, parties, films, karaoke and much more is provide so there will always be something new and fun to do and try out. Celebrity also organise Toddler Time sessions so under 3s can get together with each other and their parents and enjoy a playtime together. There is plenty for teens to enjoy as well at the X-Club teen entertainment hangout. There are sports, games consoles and discos, all fully supervised by trained youth counsellors. You can choose from ocean or river options, all of which are much more adventurous than your usual cruise holiday. Launched in 2011, Celebrity Silhouette offers some of the best-loved and latest Solstice Class features. Part of Celebrity's Millennium Class, Celebrity Constellation has been 'Solsticised' to receive the rest of the Solstice Class enhancements. The first of the Solstice Class and one of the most decorated ships in the fleet, Celebrity Solstice is a luxury ship which is a destination in itself. Launched in 2001, Celebrity Summit has been 'Solsticised' to receive the rest of the Solstice Class enhancements as enjoyed by her sister ships. With a 'Solsticized' sense of style, Celebrity Infinity features some of the most innovative features that guests have come to know and love from Celebrity Cruises. Launched in 2004, refit in 2013, Celebrity Xpedition offers mega-yacht cruising around the Galapagos year-round. Launched in 2010 as part of Celebrity’s Solstice class, Celebrity Eclipse offers a ‘laid-back luxury’ style of cruising. Featuring many of the award-winning Solstice Class features, Celebrity Millennium offers the unique AquaClass, spa-inspired staterooms. Offering a choice of 7, 10 and 13-night cruises, you can explore the mythical archipelago of the Galapagos Islands for as long as you like on Celebrity Xperience. Launched in 2009 as part of Celebrity's Solstice Class, Celebrity Equinox captures the essence of premium cruising. Aboard Celebrity Xploration, you'll experience the Galapagos on a vacation like no other.